In California, 85,000 owners of the Toyota Prius and two other hybrids were granted special stickers providing access to High-Occupancy Vehicle (HOV) lanes, even with a single occupant in the car. That all ends on January 1st. California Gov. Arnold Schwarzenegger signed a bill yesterday extending certain HOV-Lane Access stickers for four more years. 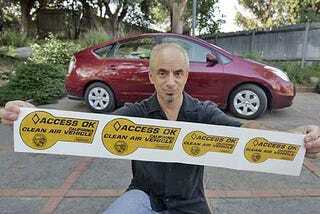 The yellow HOV stickers slapped to the sides of 85,000 hybrid vehicles weren't included in the extension. That means that when they expire on December 31st, it's sayonara to the smug-smile-inducing privilege. Instead, Schwarzenegger extended the expiration on stickers plastered on a group of green vehicles that are far less common: Electric cars like the Tesla Roadster and those that run on natural gas like the Honda Civic GX or hydrogen — like the rarer-than-a-fillet 2010 Honda FCX Clarity.